In the United States of America, a hospital can receive trauma center status by meeting specific criteria established by the American College of Surgeons (ACS) and passing a site review by the Verification Review Committee. Official designation as a trauma center is determined by individual state law provisions. Trauma centers vary in their specific capabilities and are identified by "Level" designation: Level-I (Level-1) being the highest, to Level-III (Level-3) being the lowest (some states have five designated levels, in which case Level-V (Level-5) is the lowest). The highest levels of trauma centers have access to specialist medical and nursing care including emergency medicine, trauma surgery, critical care, neurosurgery, orthopedic surgery, anesthesiology and radiology, as well as highly sophisticated surgical and diagnostic equipment. Lower levels of trauma centers may only be able to provide initial care and stabilization of a traumatic injury and arrange for transfer of the victim to a higher level of trauma care. Trauma centres grew into existence out of the realisation that traumatic injury is a disease process unto itself requiring specialised and experienced multidisciplinary treatment and specialised resources. The world's first trauma centre, the first hospital to be established specifically to treat injured rather than ill patients, was the Birmingham Accident Hospital, which opened in Birmingham, England in 1941, after a series of studies found that the treatment of injured persons within England was inadequate. By 1947, the hospital had three trauma teams, each including two surgeons and an anaesthetist, and a burns team with three surgeons. The hospital became part of the National Health Service on its formation in July 1948 and closed in 1993. The NHS now has 27 major trauma centres established across England, 2 in Scotland, and one planned in Wales. In the United States of America, trauma centers are ranked by the American College of Surgeons (ACS), from Level I (comprehensive service) to Level III (limited-care). The different levels refer to the types of resources available in a trauma center and the number of patients admitted yearly. These are categories that define national standards for trauma care in hospitals. Level I and Level II designations are also given adult and or pediatric designations. 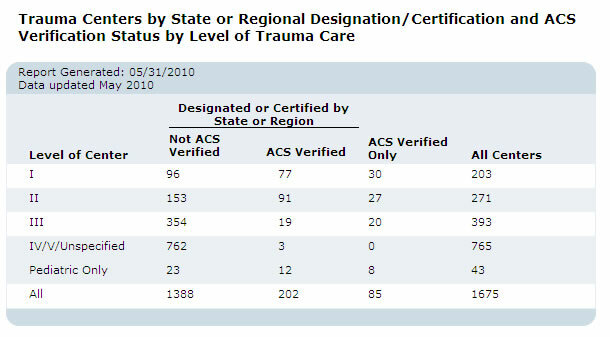 Additionally, some states have their own trauma-center rankings separate from the ACS. These levels may range from Level I to Level IV. Some hospitals are less-formally designated Level V.
The Trauma Information Exchange Program (TIEP)  is a program of the American Trauma Society in collaboration with the Johns Hopkins Center for Injury Research and Policy and is funded by the Centers for Disease Control and Prevention. TIEP maintains an inventory of trauma centers in the US, collects data and develops information related to the causes, treatment and outcomes of injury, and facilitates the exchange of information among trauma care institutions, care providers, researchers, payers and policy makers. A Level I trauma center provides the highest level of surgical care to trauma patients. Being treated at a Level I trauma center can reduce mortality by 25% compared to a non-trauma center. It has a full range of specialists and equipment available 24 hours a day  and admits a minimum required annual volume of severely injured patients. In addition, these trauma centers must be able to provide care for pediatric patients. Many Level II trauma centers would qualify for Level I if they were equipped to handle all pediatric emergencies. ^ Faul, Mark; Sasser, Scott M.; Lairet, Julio; Mould-Millman, Nee-Kofi; Sugerman, David (2015). "Trauma Center Staffing, Infrastructure, and Patient Characteristics that Influence Trauma Center Need". Western Journal of Emergency Medicine. 16 (1): 98–106. doi: 10.5811/westjem.2014.10.22837. ISSN 1936-900X. PMC 4307735. PMID 25671017.